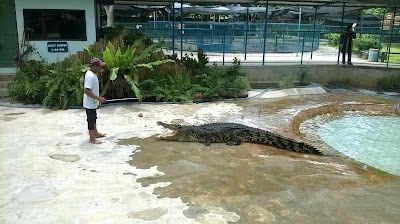 The word crocodile sometimes create fear in our mind, especially if we hang around the murky rivers close to the bank. Crocodile also earned an undeserving reputation among golfers in Borneo or Malaysia; which means a predatory golf players preying on inexperience golfers. These "crocodiles" pretended to be novice and assured the other players he played badly luring the naive golfers to bet high. Once the bet are set and agreed upon, they will be slaughtered by these "crocodiles!" But the real crocodiles avoids men as far as possible. Usually their preys are injured or old animals and once they have eaten, they spend most of their time resting; sometimes for months. As a cold blooded animal, they don't have to eat all the time. However, crocodiles only attack people when men encroached into their habitats and destroyed their environment because their natural preys had disappeared or ran away. The word crocodile comes from the Greek word meaning lizard. They are the aquatic reptiles that can be found exclusively in the tropics of Asia, America, Africa and Australia (including New Guinea). Most are semi-aquatic, where they tend to congregate in freshwater such as lakes, rivers and wetlands. Everybody knows they are carnivorous creature and not to be mess around with. They feed on fish, other reptiles and mammals. Despite its reputation as a tough animal ( their existence predate the dinosaur million of years ago) it is sensitive to cold and because of men, many are at risk and classified as critically endangered. Tuaran is 32 kilometers from Jesselton (Kota Kinabalu) and it takes about 50 minutes to reach here from the city center. The Tuaran Crocodile Farm is an interesting place to visit and I am impressed that such a farm existed for locals and tourists to see.